There are many benefits to renting a stair lift when you rent from a reputable company like Indy Stair Lifts. Your rental plan starts with the stair lift always being under warranty and you will never pay for your stair lift to be repaired if it ever breaks down. We come to perform regular maintenance as part of your rental plan to keep your stair lift running at peak performance. You get a new model stair lift that is battery operated and equal to or better than a stair lift you might purchase. And if you decide to purchase your rented stair lift, we’ll credit your rental payments to the purchase price. Stair lift rentals are ideal for individuals who may need them on a temporary basis. Temporary injuries, rehabilitations and hospice care are a few of the situations that are well served by stair lift rentals. Stair lifts can also be beneficial at the workplace after an injury. You can use the stairs at work with a stair lift and continue working after an injury. Stair lifts are the best mobility option for elderly or disable people who want to travel independently between floors in their home. When someone needs to increase their mobility for a short period of time a stair lift rental is the best way to go. You get all the advantages of purchasing a stair lift for less. 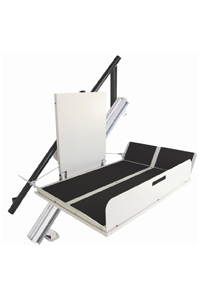 Indy Stair Lifts, a division of Nationwide Lifts, the national leader in home elevators, rents a wide variety of straight and curved stair lift models with weight capacities up to 500 pounds and seat widths up to 25 inches. Our rental models come with a full range of safety features, including safety sensors that stop the lift at obstructions and indicator lights for easy operation. The curved stair lifts offered by Indy Stair Lifts are designed to fit the exact specifications of your stairway and we will stop by your home to measure your stairway so we can accommodate it with the ideal model and we will send a trained professional staff to install it. Call us toll-free at your earliest convenience at 888-203-5754 for stair lift rental details. A stair lift rental may be the perfect solution for you or a loved one and Indy Stair Lifts is the leading stair lift provider with a rental plan that is economical and highly practical.